The newly constructed Vienna Senior Apartments are in a four story building served by two elevators. There are twenty‐eight (28) one bedroom and twelve (12) two bedroom apartments plus an apartment for the building superintendent. The one bedroom apartment is +/‐ 800 sq.ft. ; the two bedroom, +/‐930 sq.ft. Kitchens are fully equipped with refrigerator, stove/oven, dishwasher and microwave. Heating is hot water baseboard. Cooking is electric. A/C units will be provided by the owner. Common laundry facilities are located on each floor. A community room and patio will be on the third floor; lobby, mailroom and management office on the first floor. There will be 64 on‐site parking spaces. 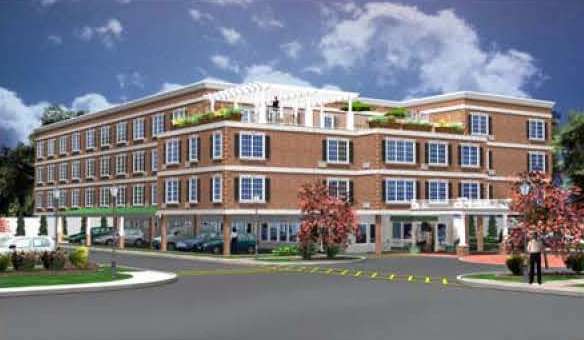 The Vienna Senior Apartments are located in the City of Rye in southern Westchester County approximately 28 miles from Grand Central Station. Rye is a Long Island Sound community bordered on the west by the Town of Harrison, on the south by Mamaroneck, and on the north by the Village of Port Chester near the Connecticut border. Rye has a vital retail shopping district and recreational facilities that include parks, beaches, golf and nature centers. A Federal Express office, the GAP and medical offices can be found on nearby Theodore Fremd Ave. (Vienna Senior Apartments are located at the corner of North St. and Theodore Fremd Ave.) The Rye Ridge Shopping Center has pharmacies, restaurants, banks and specialty shops. There are major shopping malls in Port Chester and White Plains. The Rye Senior Advocacy Committee has prepared a comprehensive directory of senior services. The Rye Recreation Department Seniors Program offers exercise, stretching and balancing, dancing, and other classes as well as special events and trips. The Rye YMCA with a senior discount membership rate offers a Senior Health & Fitness Program, including swimming classes. There is a Rye Free Reading Room with a Tech Center. Purchase College offers lifelong learning opportunities. Vienna Senior Apartments offers easy access to I‐287, a major east‐west roadway in mid‐Westchester County and I‐95, a major north‐south roadway. Rye is served by the New Haven Metro North Railroad with a Rye train station less than a mile from the apartments. The City is also served by the county's Bee-Line bus Route 61 (Bronx, New Rochelle, Port Chester) with a stop within 0.04 mile of the site.